Beginning 11/26/18 Fr. Gregory’s office hours on Mondays will be 3:00-8:00 p.m. 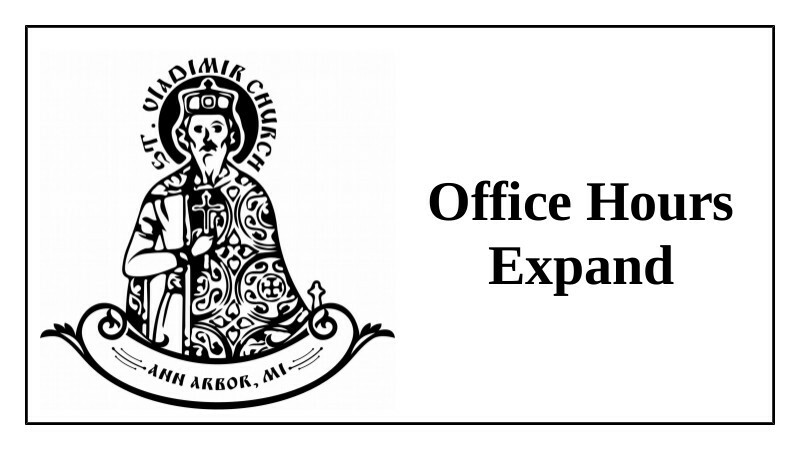 The idea is to have office hours at the parish church on Mondays so that we can advertise for people to stop by and learn about our faith – that the church will always be open 3:00-8:00 p.m. on Mondays. You will still be able to make appointments with Fr. Gregory on Monday nights as you always have been, but you’ll have to meet him at the church on those nights. :) And if an inquirer stops buy he might have to briefly break away from you to say hello. It is important that we reach out to the local community around our parish church, and the only way to do that that we can think of is to provide a consistent time when the neighbors can stop by and learn more. Our local Lima Township folks need the Church just as much as we do! Occasionally Fr. Gregory will have a conflict on Monday evenings. If you would be willing to cover for him on the rare occasions that he needs to be away on Monday nights please contact him.